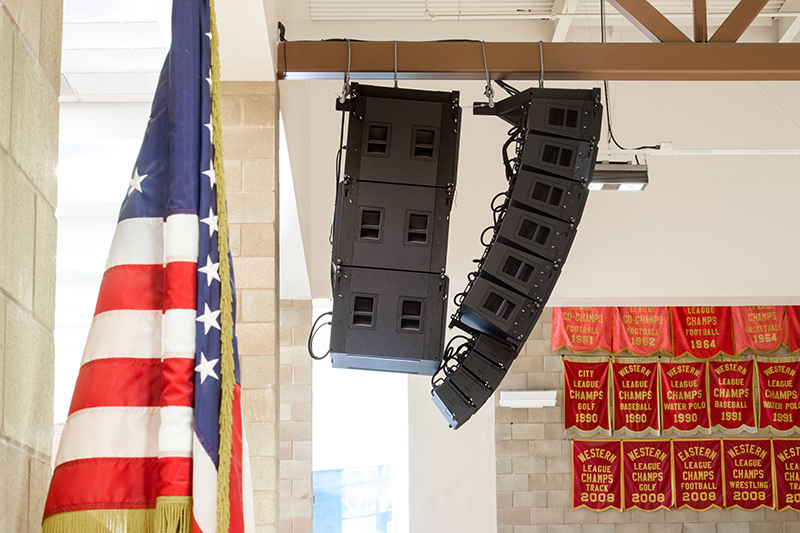 Essex Sound specified a hybrid line array configuration the combines both al-4 and al-8 acoustic elements for the 14,000-square-foot multipurpose gym at Cathedral Catholic High School. 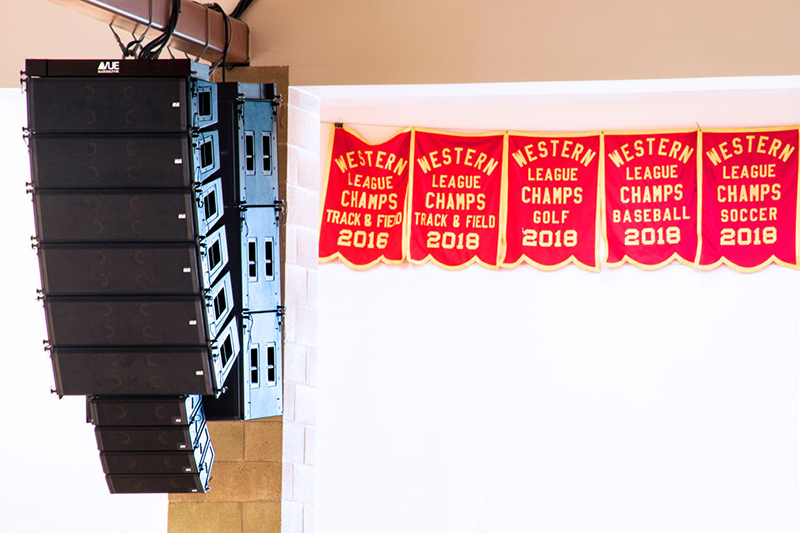 SAN DIEGO – Cathedral Catholic High School in San Diego upgraded the sound system used at its 14,000 square-foot multipurpose gym. 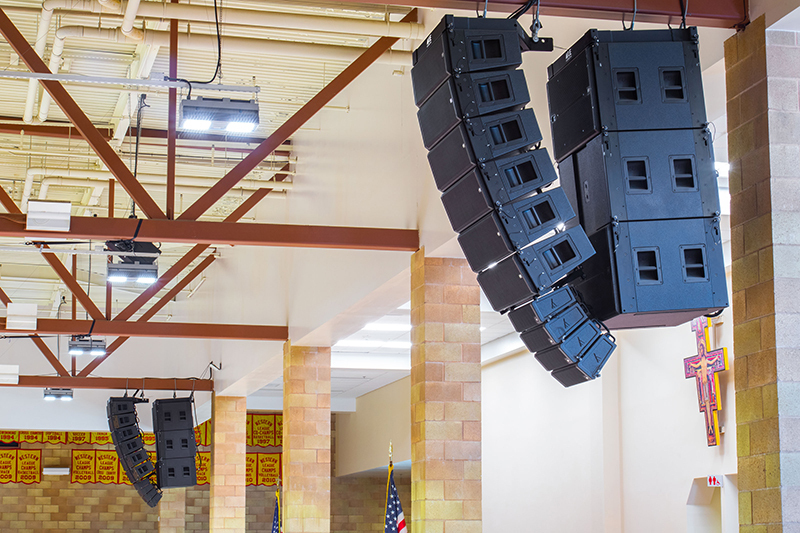 Pine Valley, CA-based Essex Sound specified VUE Audiotechnik al-4 and al-8 line array elements for the room, which has a 26-foot-high ceiling, brick walls and bleacher seating for up to 3,500. Looking to improve speech intelligibility for weekly Mass while also providing ample audio horsepower for game night exuberance, Essex tapped into VUE’s unique ACM technology and specified a hybrid line array configuration the combines both al-4 and al-8 acoustic elements. McNamer’s solution was a hybrid line array system that utilizes VUE’s unique Continuous Source Topology (CSM™), which allows different al-Class elements to be seamlessly combined for improved coverage, sight lines, and weight distribution – all without the disruptions associated with more conventional mixed element arrays. The final design includes left and right arrays each comprised of six al-8 elements above four al-4 subcompact elements for near fill. Three al-8SB flyable subwoofers are flown with each array in a cardioid configuration to minimize low-frequency incursion onto an entry concourse directly behind the clusters. For additional near field coverage down the center of the gym, the Essex team flew a single h-12W high definition two-way speaker. The PA throws approximately 100 feet to the back wall, as well as covering the main bleacher areas on each side of the gymnasium all the way up to the second story walkway. The al-Class’ predictable and tightly controlled coverage was essential to avoiding the highly reflective brick walls above bleachers. The center h-12W covers the first 30 feet down the middle, while the smaller al-4 elements at the bottom of each array handle near-fill at the far left and right. Two VUEDrive V4 series and four V6 series systems engines provide power and processing for the arrays and subs as well as full networking via SystemVUE software. Onboard VUEDrive electronics ensure the single h-12W is easily integrated into the overall SystemVUE network. Mix duty comes courtesy of a rack-mounted Behringer X32 Producer, which is easily controlled from anywhere via iPad. 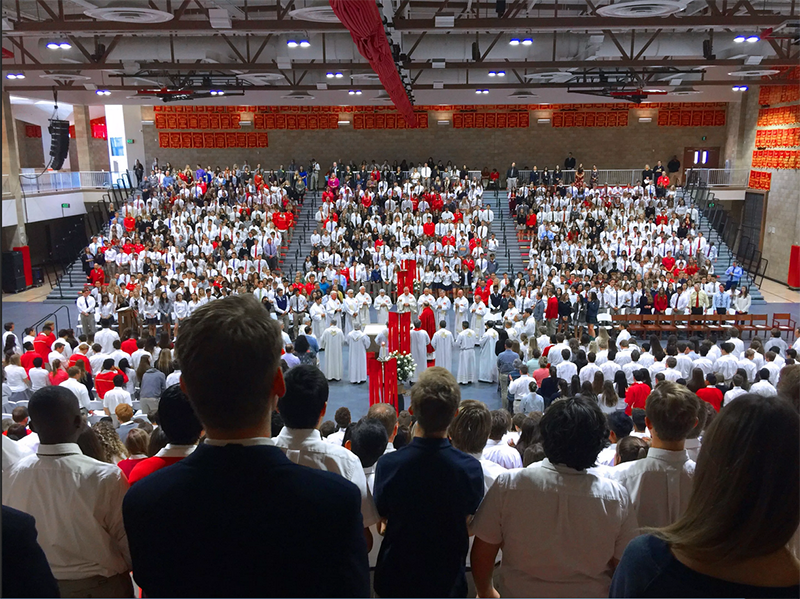 With Cathedral Catholic High School in the bag, the Essex Sound team is already looking forward to another outing with the VUE brand. And with 34-years as one of Southern California’s leading design and installation teams, their impressive client roster and packed schedule offers ample opportunity to explore the line.